WAY2BIT is a blockchain technology company established in December 2017 that concentrates on the advancement of blockchain-based platform services. WAY2BIT is developing a commercial platform called BORA to create new value using blockchain technology. BORA is a DApp platform designed to solve existing industry problems by distributing games and digital content, and incentivizing user interaction using a dual blockchain structure and proprietary token mechanism. WAY2BIT has finished development of the alpha version for the BORA platform and opened the “BORA Lagoon” testnet in October 2018. They plan to officially launch BORA in first half of 2019 and expand the ecosystem. BORA provides a solution which enables secure and transparent distribution of content and protects and unlocks the value of digital assets on the blockchain. In addition, the BORA platform is designed using a modular architecture to allow independent blockchain execution by content providers. This ensures that the data and transactions of each service are guaranteed to run independently and without impact to other services on the platform. Meanwhile, users can leverage various content services provided by the BORA ecosystem through a single, unified user experience. User identity, accounts, and assets are completely integrated and mutually compatible within the ecosystem, and the BORA platform has the performance and scalability to handle the activities of these content services seamlessly. 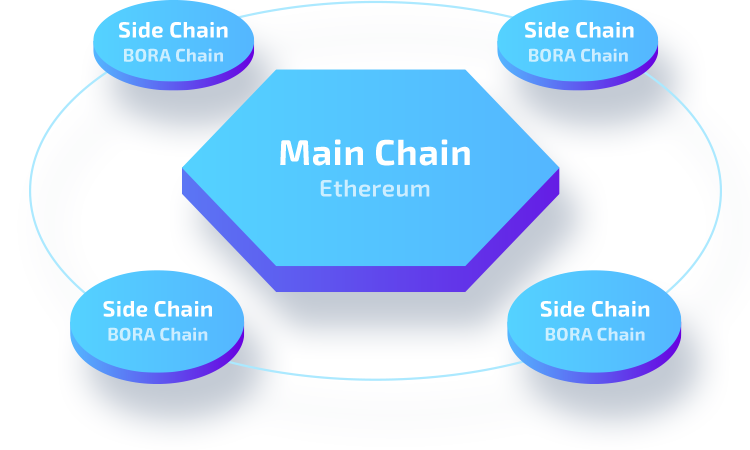 BORA uses a dual-blockchain architecture consisting of an Ethereum mainnet and multiple side-chain sets. Each side-chain set can handle 2,200 TPS (transactions per second). The design is modular and can be expanded easily. For example, a five set side-chain would have a total processing capability of 11,000 TPS (2,200 TPS x 5). There is also no structural limitation on side-chain expansion, so performance could be scaled indefinitely using additional side-chain sets. While the blockchain provides transparency and trust through immutability, realization of a usable service inevitably requires some form of recovery, whether due to negligence, mistake, or intended error. BORA has already completed technical testing and validation of recovery methods and is considering rules and policies to ensure that it is not deployed in contradiction to the principles of blockchain. This unique feature of BORA enables rich user experiences and value and offers a more realistic approach to high-quality blockchain services. Through their experience in developing a variety of traditional IT platforms, the people behind BORA are working hard to apply their development and operational knowledge to provide user-friendly experiences and features using the blockchain.